Have a pair of printed pants lying in your closet deeper than that homophobic second cousin of yours? Never know which way to wear the prints? Do you think that wearing the pants is a sure way to commit fashion faux pas? Think I ask too many questions? I mean I can’t tell you the number of times, I’ve been given “the look” when I’ve gone to a gay night out wearing printed pants. It’s funny but true – just like the fact that I have more shoes than I can wear, or worse, accommodate. Love Aztec prints? Flaunt it with black! Sometimes tartan is the way to be. Sometimes it’s Tartar sauce. If you are feeling slightly adventurous, you can experiment a bit more by going for polka dots, houndstooth or even paisley prints – like we say, it’s not fashion if you don’t dare to do it. (Okay, I said it.) In the end, the key is to make sure that the trousers are well fitted and made from a heavier fabric so that they don’t come across as pajamas. Polka dots make for great bottoms too. yeah, I just said that. Still confused? Here are a few lookbook references for you to take cues from. Go crazy! Topman on Jabong: The five must-buys your closet needs! Jeans – Where else would you get super comfortable jeans for as low as INR 2022? Topman’s premium quality jeans are on maximum 40% discount and are worth every single rupee. Guess we won’t have to sell that arm and leg after all. Underwear – A pack of 3 for INR 1000 is not a bad deal at all. Topman’s underwear are super cute, with the brand name printed almost on all of them. What’s better than telling your lover you wear fancy underwear? Telling your lover that you wear fancy Topman underwear. Sweatshirts – Be it hoodies in various plain colors or printed ones, you know you can count on Topman sweatshirts to keep you warm in this changing weather (If winter ever comes, that is). Hoodies start from INR 1800, and I start from scratch right now. Bags – Ranging from basic wallets (starting from INR 1100) to delicious black backpacks (Ranging from INR 1500 to 2800) and also the lone (but beautifully snazzy) duffel bag, Topman’s bag collection doesn’t disappoint, even if boyfriends do. Now that you know what to buy from Topman, what are you waiting for? Head over to Jabong and make those credit cards weep (or not really.) Don’t know where to go? Well, we’ve got a secret portal right here. 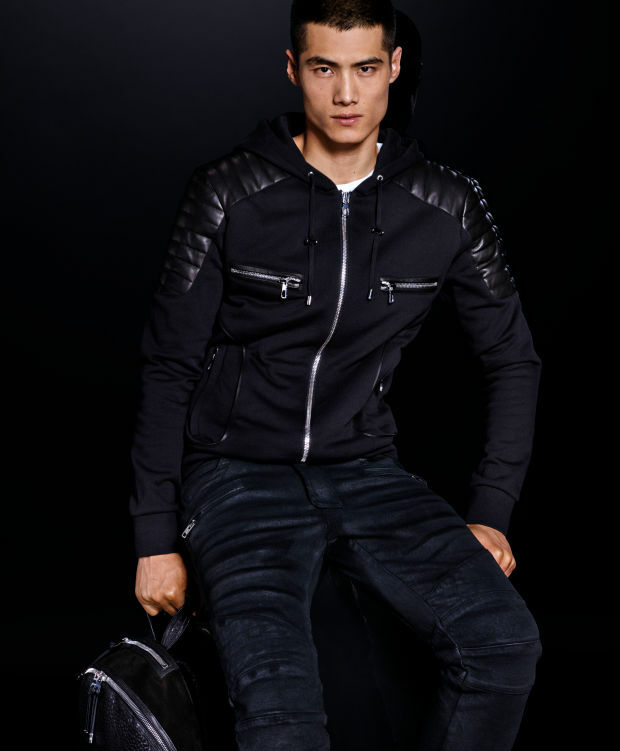 The BALMAIN X H&M India Launch: A GuyStyler Exclusive! Ever since H&M opened its fashion doors in India, our resident fashion expert, the GuyStyler (who also runs his own exclusive fashion blog here.) has made at least 10 visits to their super cool store which sells cooler clothes at an even cooler price (side note: He now needs to look for a larger wardrobe). 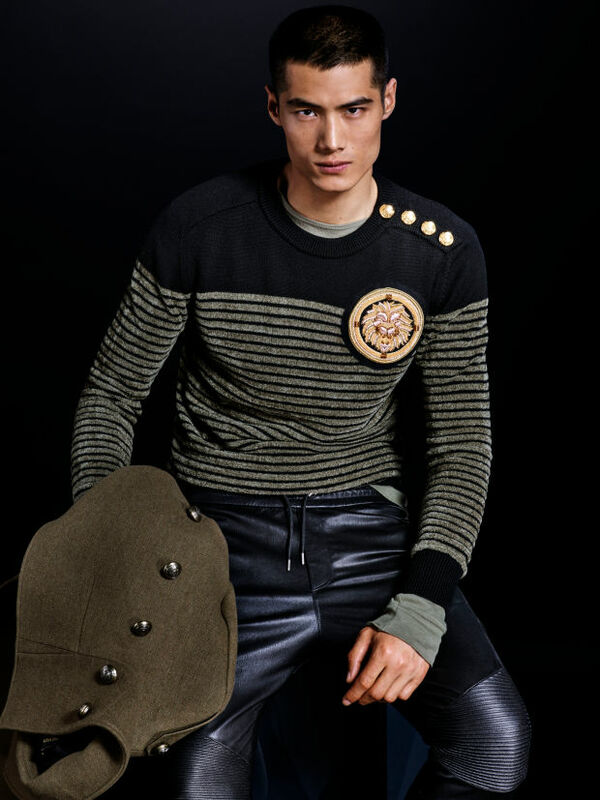 But what everyone had been waiting for was one of the biggest fashion collaborations of recent times – Balmain X H&M. Sharp-shouldered jackets and military detailing, what more can we ask for? Known for their sharp-shouldered jackets and military detailing, collaborating with a mass brand like H&M was a challenge for 29-year-old creative director Olivier Rousteing. Despite his love for H&M, Rousteing said that this collaboration was a huge task given the fact that Balmain is super-expensive (goodbye, credit cards!). Changing of fabric and using less embroidery helped them achieve the unachievable – creating fashion for everyone. And the spectacular result is in front of us! 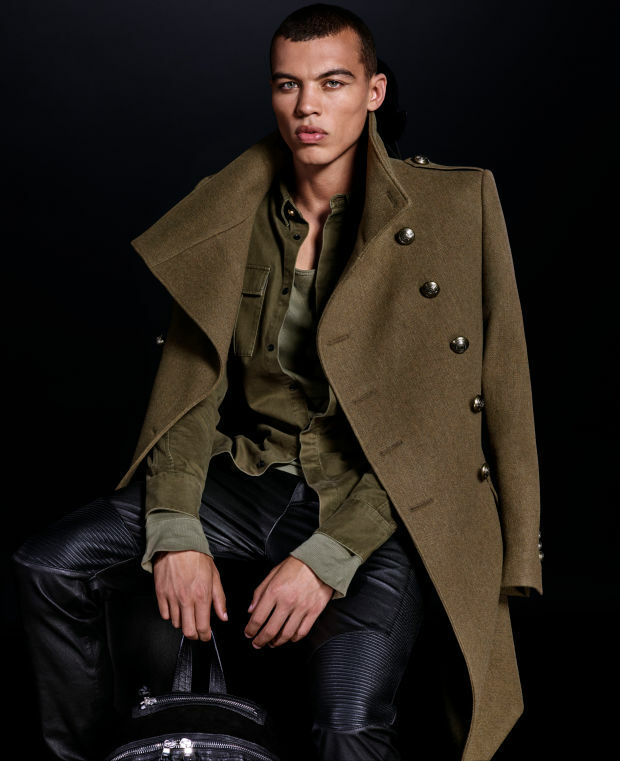 The very affordable collection is full of military-inspired pieces – from military green overcoats and black jackets to coats with gold detailing and chunky gold buttons. A majority of the collection features edgy monochrome looks with lots of zipper detailing – as seen here in the black statement jumpsuit, which has a dazzling zipper in the front. This is all really fancy but how does this help you, you ask? We saw that coming. Take cues from this beautifully shot lookbook and shop for your favorite look with us right here. One of the must-have pieces (and our expert’s personal favourite) would be the gorgeous red and black biker jacket featured below – it’s wicked and it’s funky as hell! What’s more? This gorgeous red and black biker jacket is wicked and it’s funky as hell! Hold on. We aren’t done yet. Here’s more good news! There’s a second H&M store that just opened in Delhi (that might add some relief to those who’ve had to wait in line for hours to get billed) and we plan to get there faster than we can say ‘I-have-no-new-clothes-to-wear’. Now now, Bombay, are you listening? So while we celebrate one of our favourite fashion brands launching in India, why don’t you check out the look book here?